Entry : None of the events are ticketed. Studio Safdar is unable to pay anything to the artists who enrich our lives, unless you contribute. We’ll spread the chadar at the end of the performance. These contributions will be shared 50:50 with the artists. 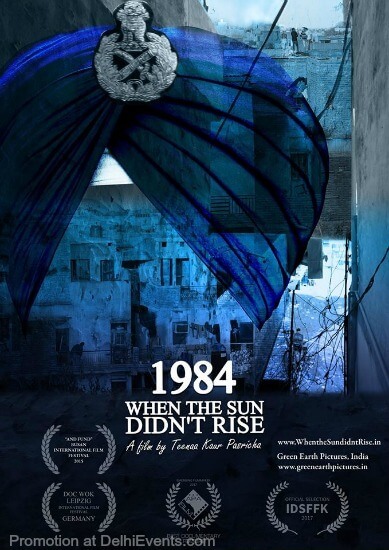 Event Description : MOVIE "1984: When The Sun Didn't Rise"
To commemorate the 33rd anniversary of the 1984 Anti-Sikh pogroms in the country, Studio Safdar is organizing a screening of the award-winning documentary "1984: When The Sun Didn't Rise (Jis Din Suraj Ugya Nahi)". The film is a story of three women who lost their men in the pogrom of 1984 when after the assassination of Prime Minister Indira Gandhi more than 30,000 Sikhs were killed across India. These Sikh women live in the Widows Colony of New Delhi where more than 3000 women still live with their families.The film is a narrative brings to light the brave undying spirit of these women who are earning their livelihood despite being illiterate and still negotiating their memories. The film is a story braiding the past with present using rare archival footage of in 1984 during the times of the then Prime Minister Indira Gandhi. There has been no justice in this matter and various Governments in India have tried to subjugate the same. ​Cinephiles and history enthusiasts, we are a day away from the screening and filmmaker Teenaa Kaur Pasricha will be joining us too! Look forward to seeing you all!